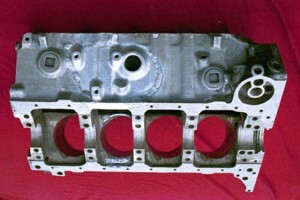 We specialize in Aluminum Engine Block Repair. This is a damaged 1969 Can Am Chevy ZL1 Aluminum Engine. Two broken connecting rods caused this damage. 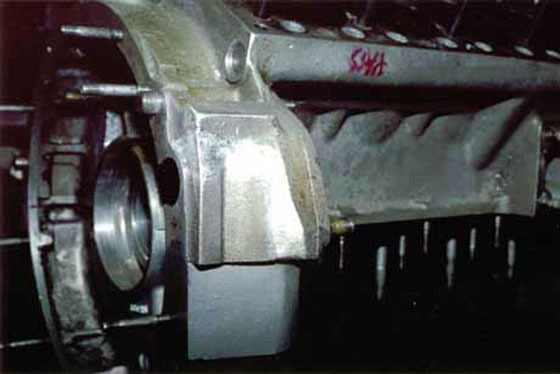 Both cylinder walls and the oil pan rails were left on the racetrack. The race was delayed while track personal cleaned up the mess. I made new aluminum plates and cylinders to repair this ZL1 block. We digitized an identical ZL1 block. A foundry cast new aluminum 356-alloy plate and cylinders blanks. Our new engine block side plate was C.N.C. machined from this digitized tool path. We made new cylinders from the cast blanks. See how we do it for details. 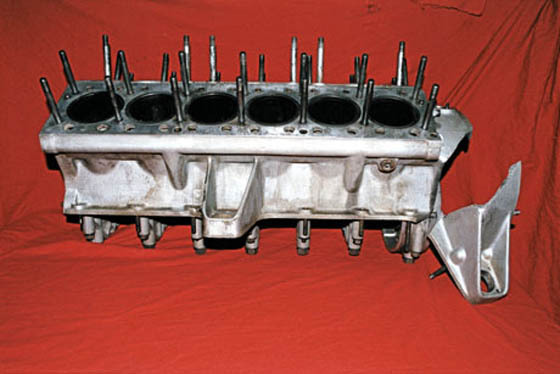 This Damaged Ferrari 330 Aluminum Engine Block was restored to as new Condition. We built a Fixture to hold all the parts together. We then Pre Heat Damaged Aluminum Engine Blocks in our 100 cubic foot Computer Controlled Electric Element Furnace. Proper Pre Heating Reduces distortion. 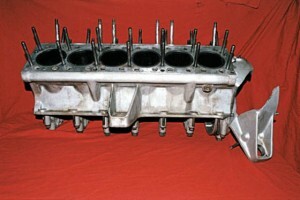 We have successfully Repaired Ferrari 330 Aluminum Engine Blocks. We T.I.G. Weld after the Damaged Ferrari Aluminum Engine Block is heated to 275 F. After we have finished T.I.G. Welding we return the block to the furnace and complete a controlled cool down cycle. 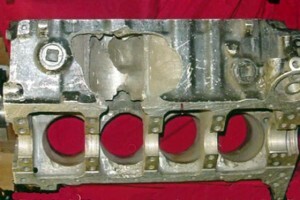 I been specializing in Aluminum Engine Block Repair for many years. 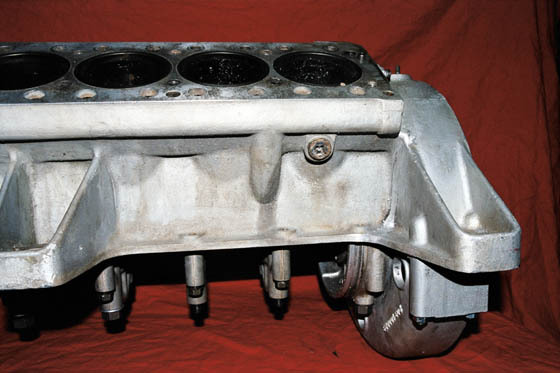 Connecting Rod Failure Damaged this Ferrari Daytona Aluminum Engine Block be repaired. To fill the holes we will cut the new Pieces of Aluminum needed from a 356 Aluminum Alloy Ingot. We tack Weld the Replacement parts in place before Preheating. 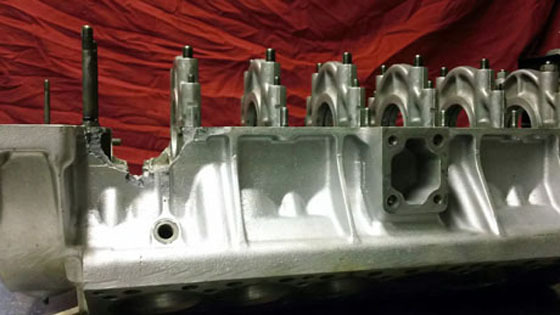 This Restored Ferrari Daytona Aluminum Engine Block is ready for Finish Machining. We will not restore the outside of the block to its original condition as per owner request. 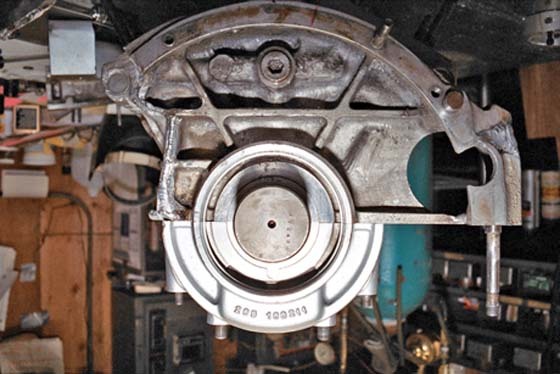 The Engine Builder will Machine the oil pan rails, align bore the main bearings housing, machine the belhousing flange and install new cylinder sleeves. We are not sure what caused this Vintage Ferrari Aluminum Engine Block Damage. This photo shows the broken right side of the block already welded in place. The left side of the belhousing fell off as we prepared the crack for the Aluminum T.I.G. Welding repair. 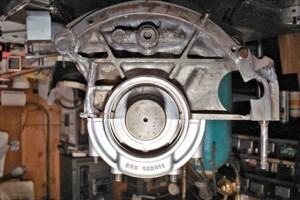 This photo shows the starter housing side of this T.I.G. 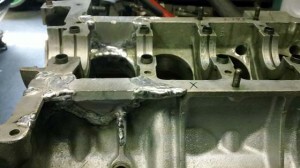 Weld Repaired Vintage Ferrari Aluminum Engine Block after welding. After we Finished T.I.G. welding this Vintage Ferrari Aluminum Engine Block We then finished all the welds to match the original cast surfaces.